Luh Luh Lan is an Associate of Strategic Concepts International, Deputy Director of the Corporate Governance and Financial Reporting Centre, National University of Singapore Business School, and a faculty member in Law with the Department of Business Policy at the National University of Singapore. Prior to joining NUS as an academic, she practiced as an advocate and solicitor in banking and corporate law with Messrs Allen & Gledhill, one of the leading law firms in Singapore and in the region. She is a member of the Singapore Academy of Law and she is also the honorary member of the NUS Business School Chinese Alumni where she acts as an advisor to the board. Luh Luh earned her Ph.D. in Business Policy with the National University of Singapore. She has a LL.M (First Class) with the Faculty of Law, University of Cambridge where she also received a Book Prize from Magdalene College. She obtained her LL.B (Honours) from the Faculty of Law, National University of Singapore, where she spent her undergraduate days on a scholarship conferred by the Overseas Union Bank. 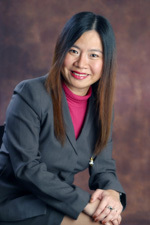 She is the co-author/contributor of several books in corporate law and management which include Walter Woon on Company Law (2005, Thomson-Sweet & Maxwell, with Tan Cheng Han as the General Editor); Woon's Corporations Law (2005, LexisNexis); From Conformance to Performance: Best Corporate Governance Practices for Asian Companies (2006, McGraw Hill, with Mak Yuen Teen as the General Editor) and 36 Stratagies of the Chinese (1998, Addison Wesley, with Wee Chow Hou). Besides research and teaching university courses, Luh Luh also conducts high level seminars and training in the area of corporate law, banking law and corporate governance. She is a highly sought after speaker in executive and professional seminars in Singapore and overseas. She has given seminars to Motorola Singapore, the Singapore Institute of Directors, the Singapore Association of the Institute of Chartered Secretaries and Administrators, Guangdong Local Tax Bureau, Bank of China, Party School of Chong Qing Municipal Committee of CPC etc. to name a few. In addition, being effectively bilingual, she is the only instructor from the Business School who teaches both the English and Chinese Asia-Pacific MBA courses catering for middle and top level managers. Wee, C. H. and Lan, L. L. 1998. The 36 Strategies of the Chinese - Adapting Ancient Chinese Wisdom to the Business World. Cambridge: Singapore: Addison Wesley. Lan, L. L. and Heracleous, L. 2007. Negotiating the minefields of corporate vote-buying. Forthcoming. Lan, L. L. and Heracleous, L. 2005. Shareholder votes for sale. Harvard Business Review, June, "Forethought" section: 20-24. Walsh, M., Lan. L. L., Lwin, M. O. and Williams J. 2003. Marketers' Boon in Cyberspace: The Anticybersquatting Consumer Protection Act, Journal of Public Policy & Marketing, 22(1): 96-101. M O Lwin, J Williams and Lan, L.L. 2002. Social Marketing Initiatives - NKF's Organ Donation Programs in Singapore, Journal of Public Policy & Marketing, 21(1): 66-77. Lan L.L. and Lwin, M.O. 2001. An Overview of the advertising laws and regulations in Singapore, The Journal of Business Law, July: 399-413. Enright, M, Lwin, M.O. and Lan, L L. 2001. Marketing perspectives on Asia-Pacific electronic commerce, International Quarterly Journal of Marketing. 1(1): 107-115. Lan, L L and Lwin, M.O. 1999 "An overview of the electronic commerce laws & policies in Southeast Asia". International Company and Commercial Law Review, 55-60. Lan, L.L. and Ho., Y.K. 1999. The Par Value of Shares: An Irrelevant Concept in Modern Company Law, Singapore Journal of Legal Studies, December: 552-572. Lan, L.L. 1999. The Takeover Saga of Yeo Hiap Seng, Asian Case Research Journal, 3(2): 169-194. Lwin, M. O., Lan, L.L. and Khoo, A. 1999. Advertiser Adherence to Regulatory Codes in The United States And Singapore: A Comparative Evaluation Of Television Commercials, Journal of Asian Business, 61-79. Lan L. L. and Leong, S. 1998. Nervous Shock, Rescuers and Employees - Primary or Secondary Victims? Singapore Journal of Legal Studies, July: 121-139. Lee, J, and Lan, L.L. 1997. Force-field Analysis on Policies affecting Working Women in Singapore, Journal of Management Development, 16(1): 43-52. Tan, C.H., Lan, L. L et al. 2005. Walter Woon on Company Law. 3rd edition. Singapore: Thomson Learning - Sweet & Maxwell. Anandarajah, K., Lan L..L. et al. 2005. Woon's Corporations Law. Singapore: LexisNexis. Mak, Y. T., Lan L. L. 2006. From Conformance to Performance: Best Corporate Governance Practices for Asian Companies. McGraw-Hill.